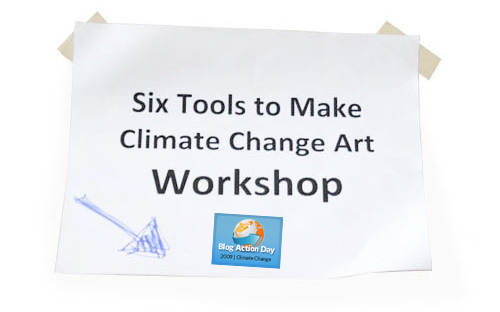 So, let me share with you my Six Tools for making climate change art. They are intended to help anyone — even the most-analytical-I-can’t-draw-a-straight-line-but-I-do-have-an-opinion kind of person express themselves visually. What are the Six Tools to make climate change art? And why were they developed? Two years ago, I was invited by the McMichael Gallery to present “A Green Winter: Will Global Warming Be Good for Canada?” with the idea that it would give students an example of ‘new media’ climate change art. So, I started with two very simple ideas. #1. I wanted the students to understand that artists can make a difference in the world. #2. 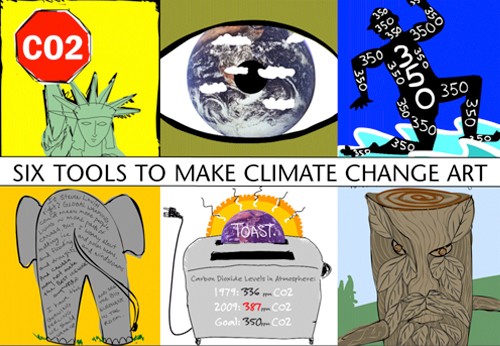 I wanted to give them the tools to make climate change art on their own — so I wrote down the six tools I rely on. When you see my list of six tools you will nod your head in recognition. These are all familiar tools that everyone can use. We just have to be creative — and judicious — in choosing the right tool to communicate the idea, so that our artwork can be memorable AND inspire action. OK. There are more than Six Tools — but six is a good start to help you structure your thinking. Most importantly, the tools apply to ALL forms of art. For this post, I’ll be talking about collage, but once you understand how the Six Tools work, you’ll see they are the basis of all great art and communication. The response to the Six Tools has been very positive. Since 2007, I’ve seen non-artists (and artists) create powerful and expressive artworks using the Six Tools method. I’ve spoken to teachers and students from junior high school to university level in Canada and the USA. A recent climate change camp for teachers resulted in Sparking Your Green Conscience being integrated into a lesson plan for Ontario teachers. It’s now available as a teacher resource on the OTF website. 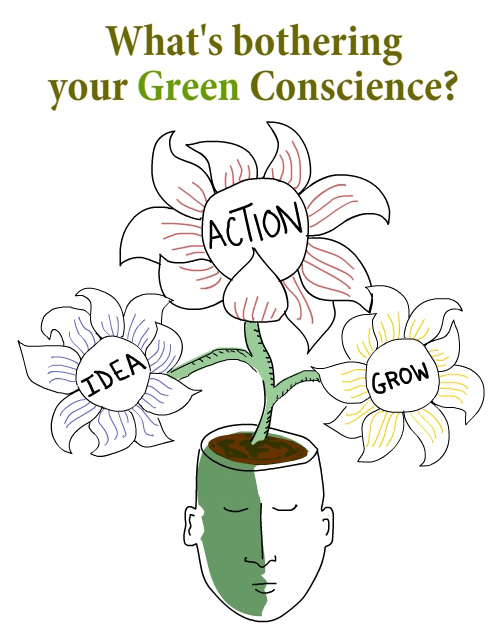 Do you have a Green Conscience? Here’s a quick quiz if you want to find out. I’ve been bothered by my green conscience for awhile and it’s spurred me to do all sorts of things — like selling our only car (an SUV), and challenging City Hall for the right to build a green driveway. 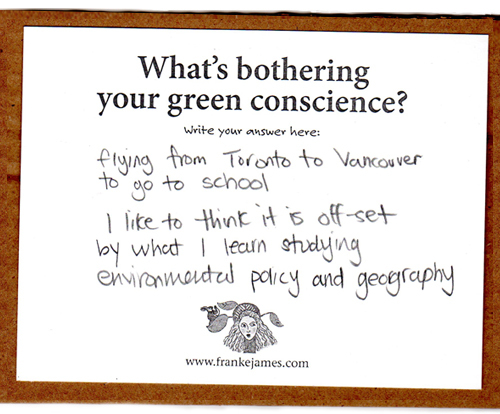 Knowing that everyone has something that nags at them, I start my workshops with the simple question, “What’s bothering your green conscience?” And I am amazed by how varied the responses are (which you’ll see examples of later on). Using the green conscience question as the focus for their climate change art, I then lead them through the Six Tools — it’s an easy way to help people express ideas visually. Symbols are powerful and they are everywhere! 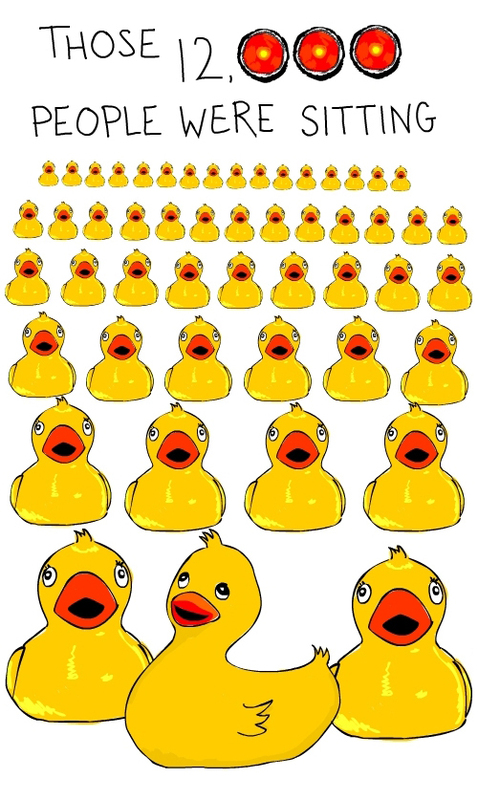 In the illustration below I’ve combined two universally recognized symbols. 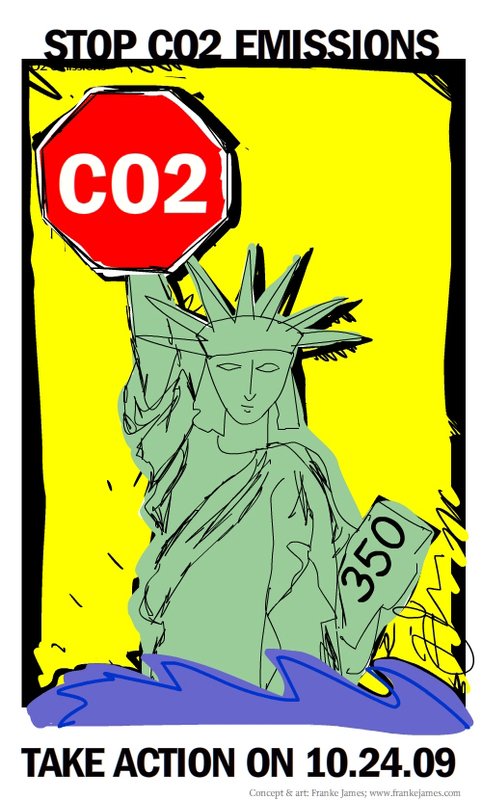 The stop sign and the Statue of Liberty are not new, but the juxtaposition of the two (with CO2 replacing the word “stop”) makes you look at them in a new way. It is ironic that the Statue of Liberty really is green. Will the United States embrace their giant green woman and lead the world in reducing CO2 emissions? The eye is a symbol that has been used throughout art history to great effect. My “eyeball” illustration below is from A Green Winter. In that real-life story, Freakonomics author and rogue economist Steven Levitt calls me a “visionary” for worrying about global warming. I was flabbergasted and responded, “Excuse me — I’m a visionary for worrying about global warming? 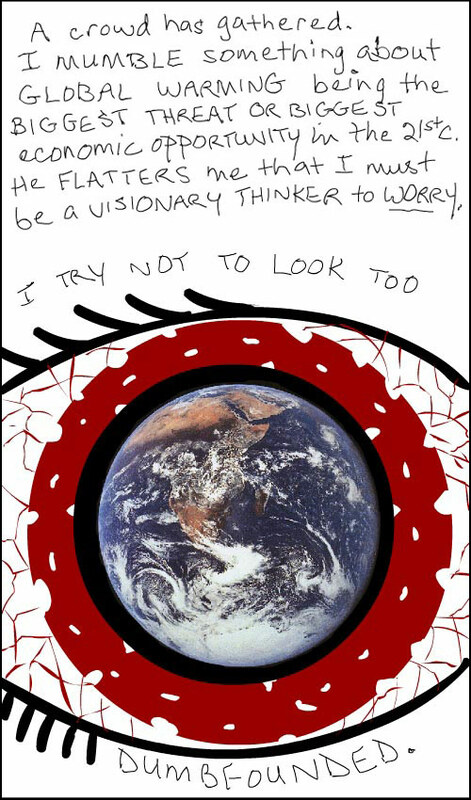 ?” I don’t know if a camera would have captured the look of dumbfoundedness on my face, but the bloodshot eyeball/globe quickly communicates how I felt. 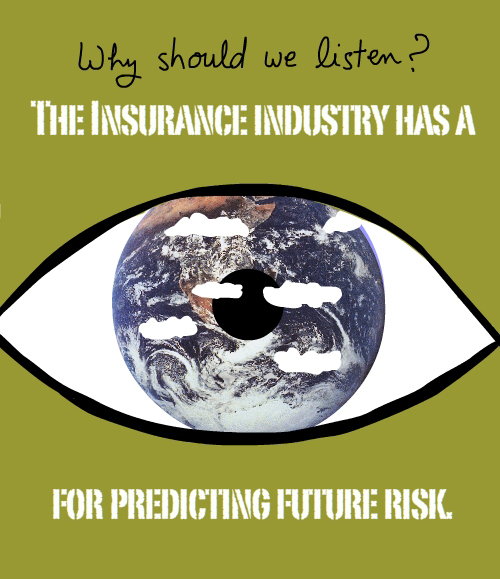 In the illustration below from Betting on the Future I’ve used the symbol of the human eye again — but this time it’s to communicate the Insurance Industry’s ability (and need) to predict future risk. The clouds floating across the iris relate to weather and climate change. I’ve shown you how I used four common symbols in my visual essays. 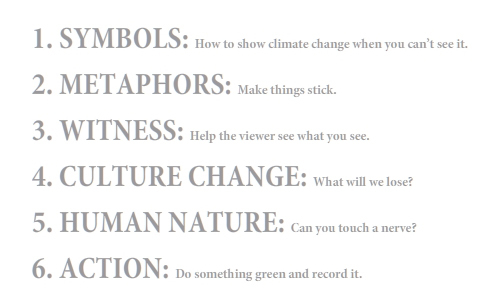 Before you start to create your climate change artwork, take a few minutes to identify the key symbols you can use. 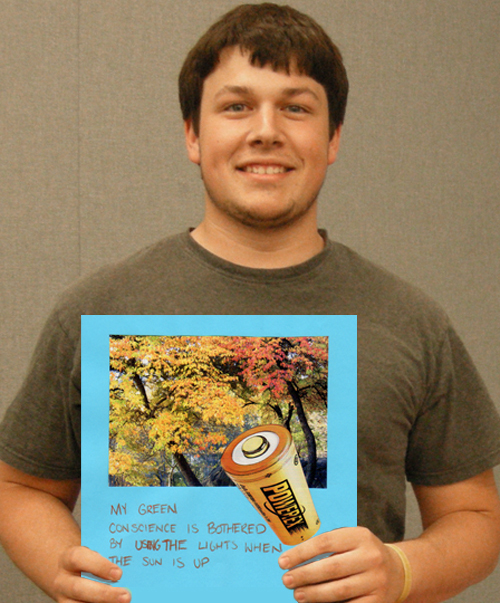 The architecture student above says, “My green conscience is bothered by using lights when the sun is up.” Hmmm…. buildings that don’t need lights on in the daytime? What a bright idea! [Six Tools workshop, University of Cincinnati, May 2009]. 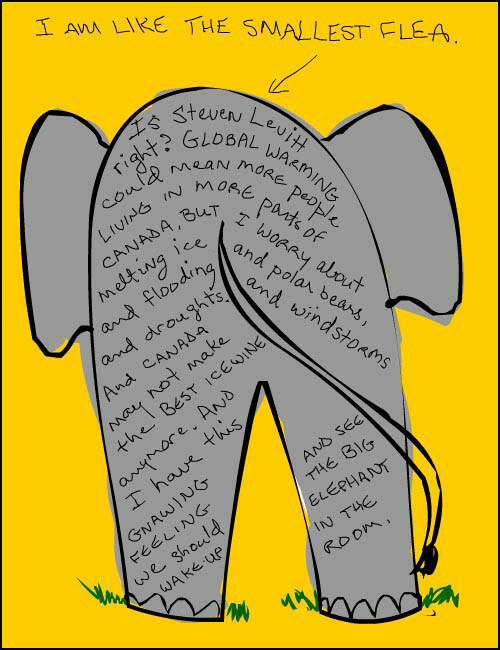 For most of us, it is more memorable to think of global warming as the ‘elephant in the room’, than to read a sentence that talks about global warming being ever-present but ignored. With images we can have an emotional connection that makes them stick in our brains. As artists, we can also merge metaphors and statistics to create memorable and impactful images. 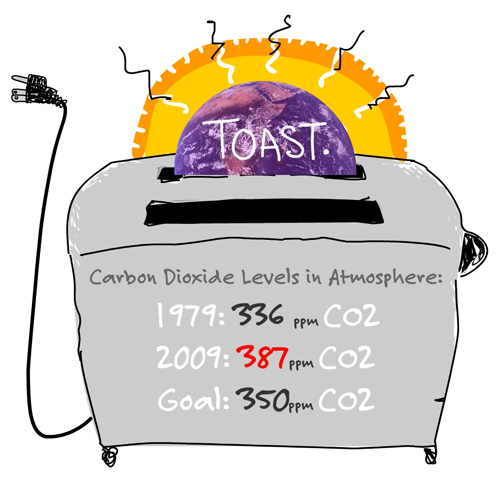 In my drawing of the Earth being toasted, the CO2 emissions for 1960 are contrasted with those from 2009, and the goal of 350ppm (which is where we should really be for the health of the planet). 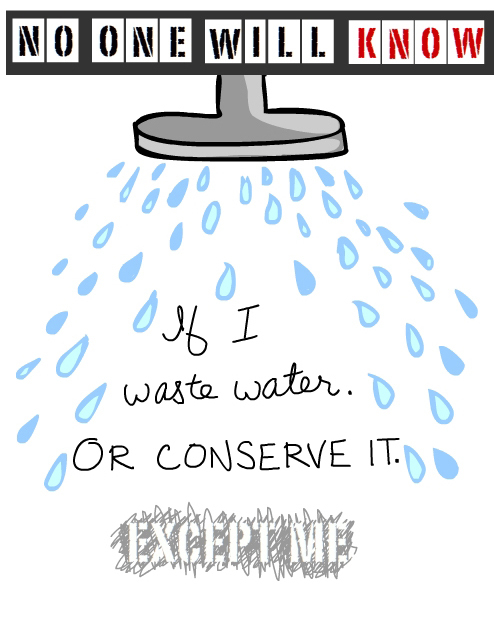 How do you illustrate showers? And long ones at that! The student symbolized time with a watch. Her typography for ‘bothered’ is appropriately agitated. And the water is cut from landscape photos in the shape of water droplets which add a poetic and metaphorical dimension to her art work. I don’t know if it was intended, but the water drops could also be seen as tear drops! [Six Tools workshop, Bates College, September 2009]. 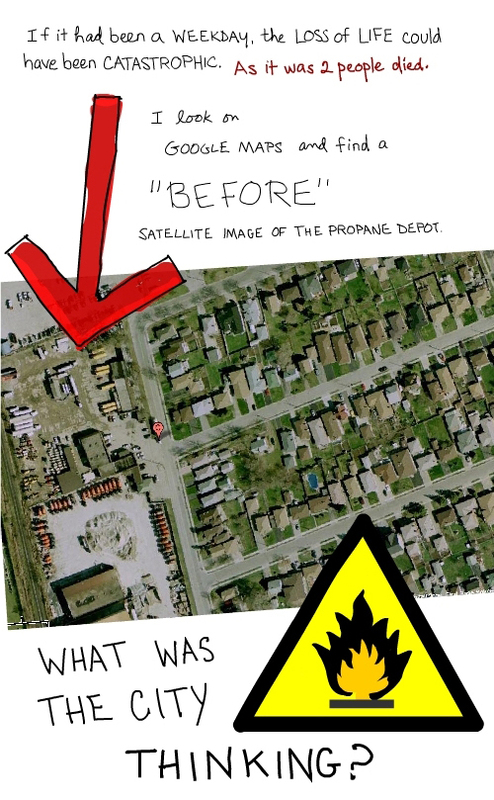 The illustration below is from my visual essay 12,000 Sitting Ducks about a propane depot explosion in August 2008 which was a few miles from our home. Although our house shook, I did not get any photos of the event. So I turned to Google Maps as my authoritative witness. Sure enough, the next day Google still had the original satellite photo of the site online. This is just one an example of how we can merge metaphors and the act of witnessing in the same piece. Fortunately, three of the four are hybrids! [Six Tools workshop, Bates College, September 2009]. Climate change is not just about science. It’s also about culture change. 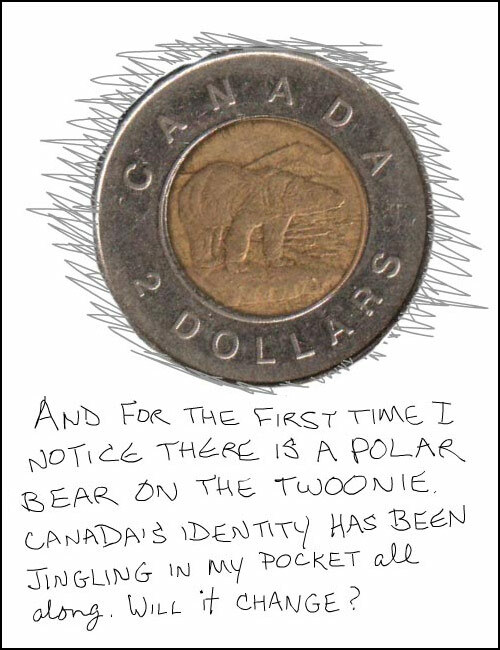 Will future generations quiz us as about the animal on our Canadian two dollar coin? 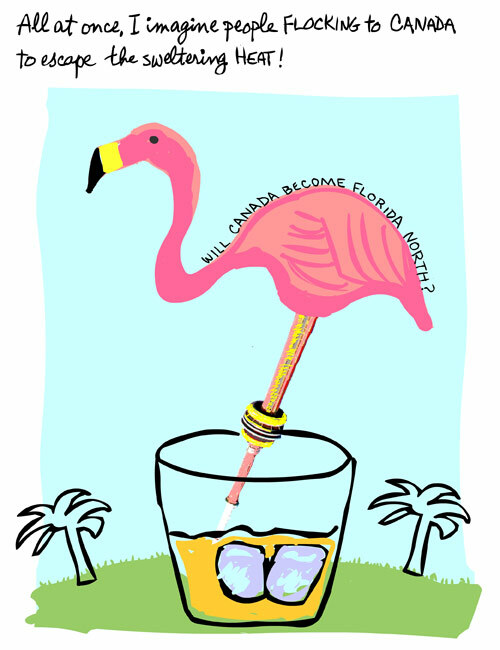 Will Canada become Florida North? Canada is world-renowned as a land of snow, and ice and hockey. How will our identity change if climate refugees flee to Canada? Matt Anthony, a product designer taking my workshop in Cincinnati says, “I feel bad when other countries want to be like US.” You’ll see he’s colored in the US with stars and stripes. Author, Thomas Friedman expressed the same disappointment about the lost green opportunity for developing countries in “Hot, Flat and Crowded.” What a shame that they are more often mimicking North American bad habits than developing new green technologies. 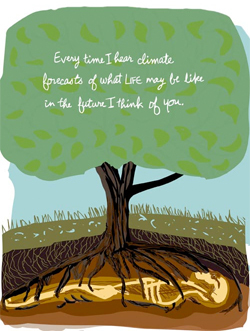 Human nature and our inherent selfishness is a favorite topic of mine in climate change art. Once you start to look around, you’ll see it’s everywhere! 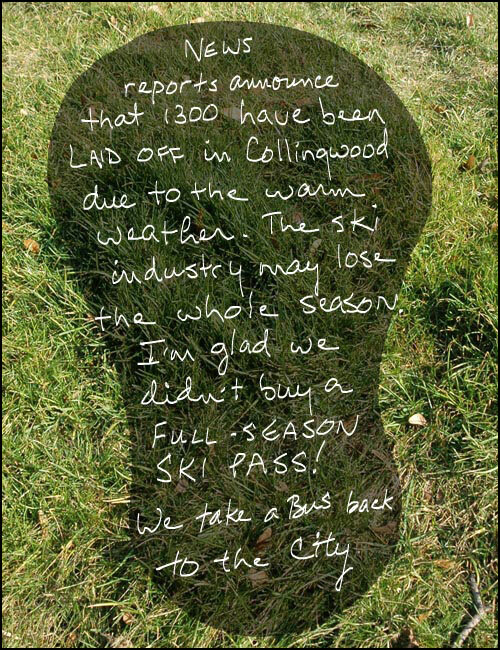 This image talk about the layoffs in January 2007 that resulted from the lack of snow — and the almost automatic reaction that many of us have — including me, “I’m glad I didn’t buy a full season ski pass!” That attitude of “I’m all right, Jack.” is a thread that goes through much of society when climate change is discussed. Will Canada suffer the worst consequences of global warming? Unlikely. It will be the poorer countries below the equator that are the worst hit by droughts, floods and food shortages. 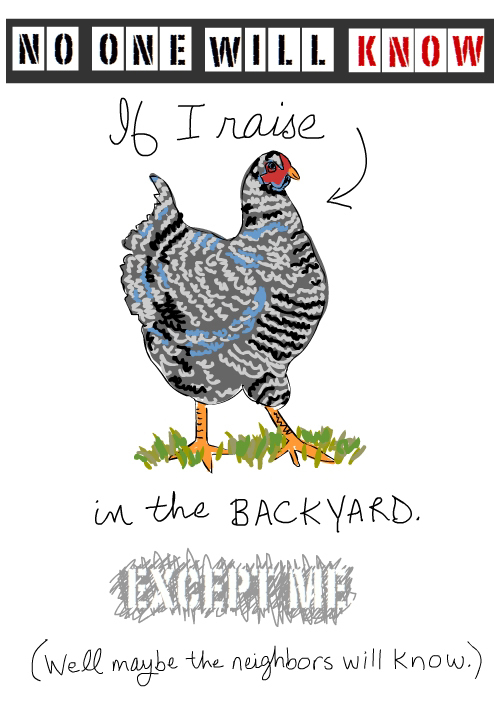 The next three illustrations are examples of the quiet conversations each of us has with our conscience. They are part of my essay No One Will Know, Except You which ironically tested my green conscience. 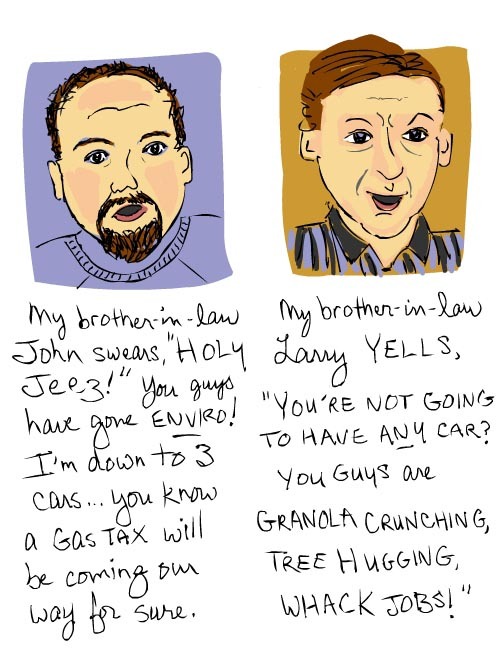 Matt Anthony expresses the inner conflict he feels from trying to be both green and eat healthy! As artists, we can turn our lives into works of art. 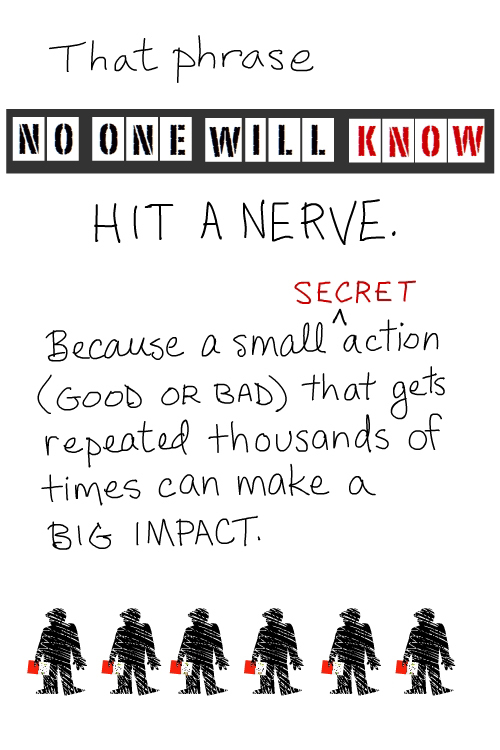 We can do something green — even small green actions will do — and then weave a story about that act. In my case, I’m making art and stories about green actions we’re taking. 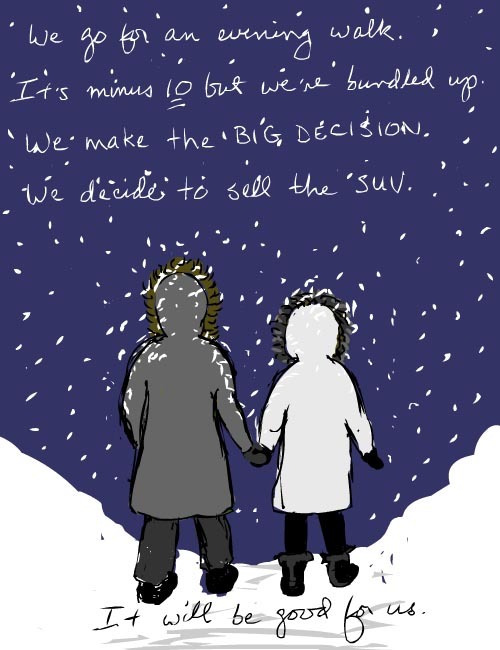 We sold our car in February 2007, and I documented it in My SUV and Me Say Goodbye. Because we didn’t have a car anymore we didn’t need a driveway — or so we thought. Paradise Unpaved tells the story of how built our green driveway and the obstacles we had to overcome. Do something Green and document it! Make a story. Draw pictures. Make a video. Tell the world what you’ve done and why. 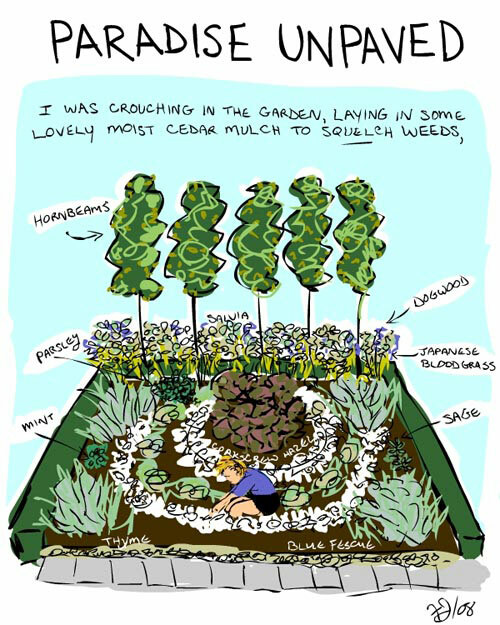 Very persuasive climate change art can be created by doing something green — and then documenting it in words and pictures. Below is a Greenpeace video from a recent direct action in Pittsburgh. What I like about this video is how it gives us insight into who the activists are and why they are risking legal prosecution, and their lives, to speak out on climate change. There are many shades of activism. Taking action on climate change covers a spectrum as wide as from black to white. For some people it will be making climate change art — and for others it will be engaging in direct actions with groups such as Greenpeace. The important thing is to understand where you fit on the activism spectrum. For me personally, my biggest hammer is creating climate change art. What about you? Skim through the Six Tools again and think of activist examples that you’ve read about in the news. Analyze how they are using them to communicate their messages in powerful ways. My recent post Can artists wake up people to climate change? features a performance art piece created by photographer Spencer Tunick and Greenpeace France. It is just one example of climate change art that uses all of the six tools to brilliant effect. 1. Read through the Six Tools which show examples for each tool. 2. 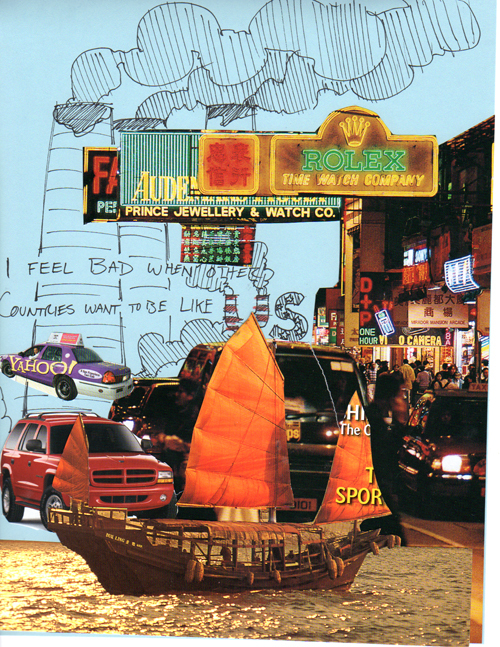 Create a collage that answers the question: What’s bothering your green conscience? – Glue sticks, felt-tip markers and scissors! On October 24th, people all over the world will participate in the world’s largest International Day of Creative Climate Action. 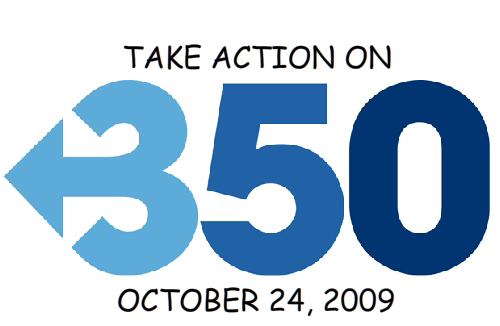 Submit your work to the 350 Art Gallery. – Writing, photographs and illustrations by Franke James, unless otherwise noted. 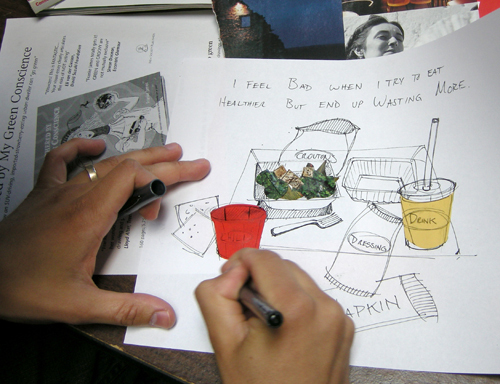 – Workshop artworks were done by students and workshop participants at the University of Cincinnati, Bates College and at book events in Cincinnati and Toronto. – Google map image © 2009 Google Inc.